All value investors today should keep the analogy in mind, and implement the overall concept. 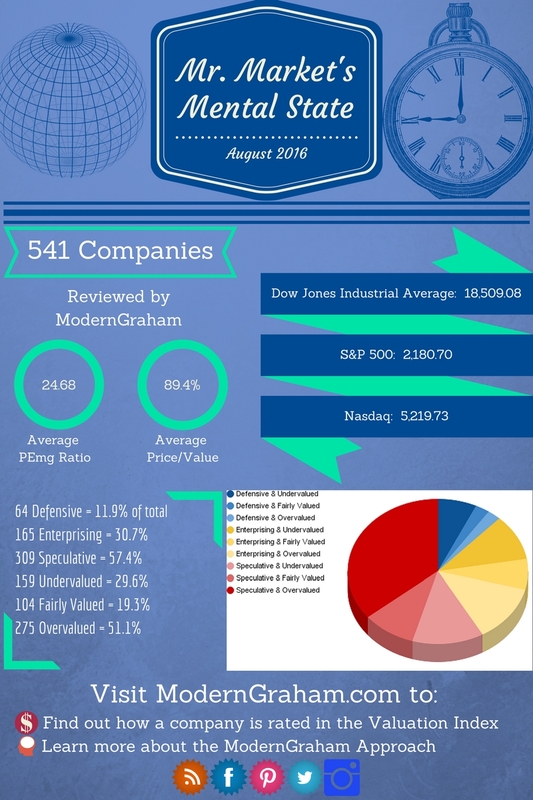 To assist in that goal, ModernGraham has various tools available, and the infographic shown above is one of them, displaying a summary of the valuations of 538 companies reviewed by ModernGraham. This month, out of the 538 companies reviewed by ModernGraham, the average PEmg ratio (price over normalized earnings) is 24.68 and the average company is trading at 89.4% of its intrinsic value. Last month, the average PEmg ratio was 23.83 and the average company was trading at 86.4% of its intrinsic value. At the time of writing, the Dow Jones Industrial Average (DJIA) was at 18,509.08. The ModernGraham Valuation of the DJIA was 20,398.09. 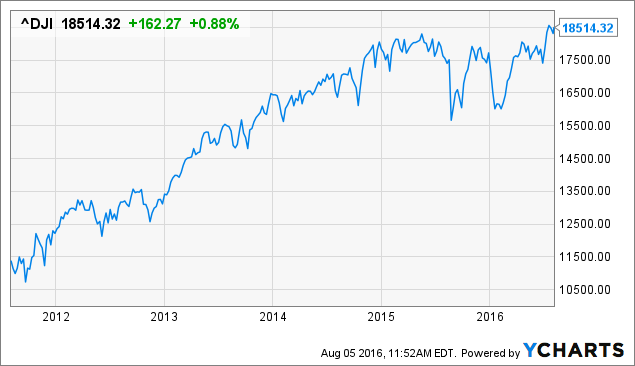 As a result, the DJIA was trading at 90.76% of its estimated value. This figure is within the ModernGraham margin of error, and therefore it appears the DJIA is presently fairly valued. The author held a long position in Apple Inc (AAPL), Home Depot (HD) and Walt Disney Co. (DIS) but did not hold a position in any other company mentioned in this article at the time of publication and had no intention of changing that position within the next 72 hours. See my current holdings here. This article is not investment advice; any reader should speak to a registered investment adviser prior to making any investment decisions. ModernGraham is not affiliated with the company in any manner. Please be sure to read our full disclaimer. Re Mr Market’s Mental State: Your valuation table did not include the names of the companies. Please resend complete table. Thanks. The names are there as links, but the text is showing up as white. If you hover over the names, they will appear. I’m working on fixing the issue. I think I’ve fixed it (I’ve changed the code in the right spot) but due to caching it may take a little time to take effect. Sorry for the trouble!